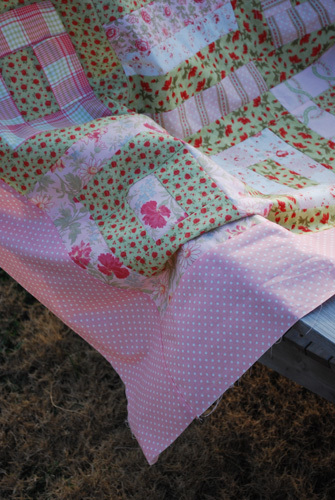 I’m so in love with Camille’s Jelly Filled pattern, and this was my first quilt using that pattern…except I used fat quarters instead of a jelly roll. On Super Bowl Sunday, one of the local quilt shops had a super sale on fat quarter…$1.25 each! Needless to say I shopped ’til I dropped. I bought a whole bunch of what I call shabby chic fabric, and I used the the Jelly Filled pattern. The pattern is for jelly rolls, but you can easily modify and use fat quarters. 2 strips that are 2.5 x width of fat quarter = 1 jelly roll strip, approximately. You can get 3 jelly roll equivalent strips from 1 fat quarter. Great way to use up fat quarters too. 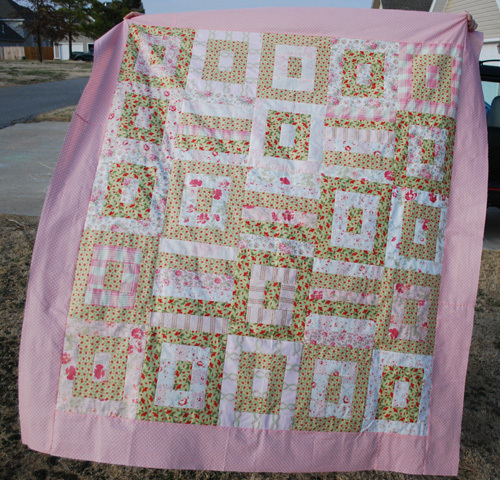 The quilt top measures 60 x66. I just got this pattern today! I ordered it when I saw this quilt. It’s beautiful! I had a jelly roll I just didn’t know what to do with. (I’m new to quilting!) Thanks for mentioning the pattern name! Thank you and you’re welcome Jen!! Have fun with the pattern! I so love this pattern…I recently bought the pint-sized jelly filled pattern to use with a honey bun, and I can’t wait to see how it turns out.